Update - Kalon Changing Trunk for changing, reading, playing! Update – Kalon Changing Trunk for changing, reading, playing! 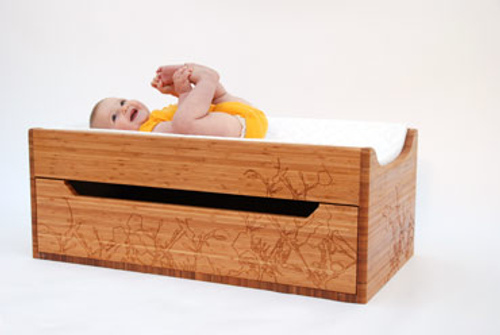 When you invest in a piece of furniture for baby, it’s great to know it will last beyond those fleeting first months. And when it’s as stunningly beautiful as this piece, you’ll want it in your home forever! 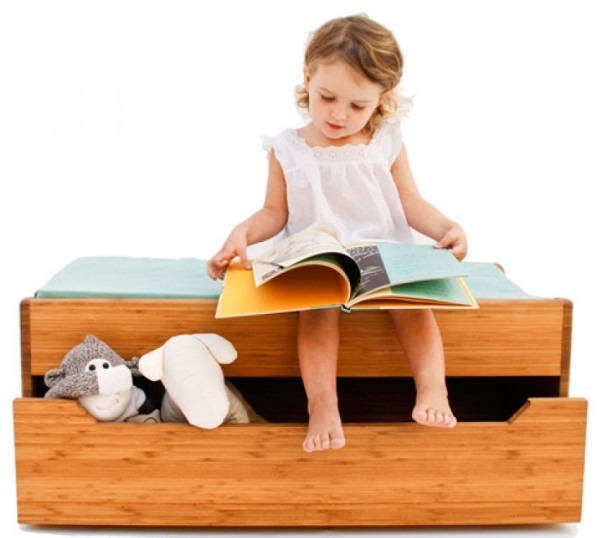 The Kalon Changing Trunk can sit atop a dresser or on the floor for nappy changes and becomes a reading bench or toy storage unit when baby has grown. It’s made from gorgeous oiled bamboo and can be laser-etched with the Kalon Studios motif or left plain. It features a roomy drawer to hold all the nappy change paraphernalia and I can see it being incredibly handy later on for all those teeny tiny toys which end up all over the house. We’ve featured Kalon’s sublime furniture before, in May 2009. The basic style is US$520, and the engraved styles – Honeysuckle and Trumpet – are $740 each from Kalon Studios which ships internationally.